Being a veterinarian, I had been called to examine a 10-year old Irish Wolfhound named Belker. The dog’s owners, Ron, his wife Lisa, and their little boy Shane, were all very attached to Belker, and they were hoping for a miracle. I examined Belker and found he was dying of cancer. I told the family we couldn’t do anything for Belker, and offered to perform the euthanasia procedure for the old dog in their home. As we made arrangements, Ron and Lisa told me they thought it would be good for 6-year old Shane to observe the procedure. They felt Shane might learn something from the experience. The next day, I felt the familiar catch in my throat as Belker’s family surrounded him. Shane seemed so calm, petting the old dog for the last time, that I wondered if he understood what was going on. Within a few minutes, Belker slipped peaceful away. The little boy seemed to accept Belker’s transition without any difficulty or confusion. We sat together for a while after Belker’s death, wondering aloud about the sad fact that animal lives are shorter than human lives. Shane, who had been listening quietly, piped up, “I know why”. Startled, we all turned to him. What came out of his mouth next stunned me. I’d never heard a more comforting explanation. He said, “People are born so that they can learn how to live a good lifelike loving everybody all the time and being nice, right?” The 6-year old continued, “Well, dogs already know how to do that, so they don’t have to stay as long”. If you have to poop, the best place to do it is right beside the litter box. Your person will appreciate you not messing it up after they spent so much time getting it clean. If you can’t make it there, the next best place is in front of the door. Do not allow closed doors in any room. To get a door open, madly dig at the carpet in front of it. Your person may have put down carpet protector in front of the door. DON’T MESS UP THEIR CARPET PROTECTOR. Dig at the carpet just beside it. When the door opens, do your best imitation of a streak of greased lightning. If a guest seems to be afraid of you, investigate him first. Try to crawl up his pants leg to become better acquainted. If you get stuck, digging will help you wiggle just a little bit further up. If any guest remarks on how adorable you are, nip them on the nose to demonstrate that you have a playful side too. Accompany guest to the bathroom, this is the best time to investigate their clothes. If one of your humans is working, sewing, knitting, or writing and another is idle, stay with the busy one. Get right in the middle of whatever they are doing. This is known as “being helpful”. For book readers, it is most helpful to crawl across the pages of the book. Try to stick your head between the pages and see how far they have read. When supervising cooking, get right behind your human’s feet. You cannot be seen, therefore you stand a better chance of being stepped on, picked up, and consoled. If done right, this often results in a treat from the guilty human. It is important to get enough sleep during the day so you are fresh during the optimum play time between 2:00 and 4:00 A.M. preferably on your human’s bed so they can join in the fun. Most importantly, begin people training early. Humans are difficult to train, but they can be taught if you start early and are consistent. If I like it, it’s mine. If it’s in my mouth, it’s mine. If I saw it first, it’s mine. If I can take it from you, it’s mine. If I had it a little while ago, it’s mine. If it’s in my paw, it’s mine. If it’s mine, it must never appear to be yours in any way. If you’re playing with something and put it down, it automatically becomes mine. If I am breaking and hiding something, all the pieces become mine. If it’s broken it’s yours, if it’s fixed it’s mine. If it looks just like me, it’s mine. If I think it’s mine, it’s mine. If I let you play with it, it’s mine. If I can drag it under the couch, it’s mine. If it’s out of your reach, it’s mine. If it’s food, it’s mine. If I lose interest in it, it’s still mine. Pick ferret up and cradle it in the crook of your left arm as if holding a baby. Position the right forefinger and thumb on either side of the ferret’s mouth and gently apply pressure to cheek while holding pill in right hand. As ferret opens mouth, pop pill into mouth. Allow ferret to close mouth and swallow. Retrieve pill from floor and ferret from behind sofa. Cradle ferret in left arm and repeat process. Retrieve ferret from bedroom and throw soggy pill away. Take new pill from foil wrap, cradle ferret in left arm holding front paws tightly with left hand. Force jaws open and push pill to back of mouth with right forefinger. Hold mouth shut for a count of ten. Remove pill from goldfish bowl and ferret from top of wardrobe. Call spouse from the garden. Kneel on floor with ferret wedged firmly between knees, hold firm the rear paws. Ignore low growls emitted by ferret. Get spouse to hold head firmly with one hand while forcing wooden ruler into mouth. Drop pill down ruler and rub ferret’s throat vigorously. Retrieve ferret from curtain rail. Get another pill from foil wrap. Make note to buy new ruler and repair curtains. Carefully sweep shattered figurines and vases from hearth and set to one side for gluing later. Wrap ferret in large towel and get spouse to lie on ferret with head just visible from below armpit. Put pill in end of drinking straw, force open mouth with pencil and blow down drinking straw. Check label to make sure pill is not harmful to humans, drink glass of water to take taste away. Apply Band-Aid to spouse’s forearm and remove blood from carpet with cold water and soap. Retrieve ferret from neighbor’s shed. Get another pill. Place ferret in cupboard and close door onto neck to leave head showing. Force mouth open with dessert spoon. Flick pill down throat with elastic band. Fetch screwdriver from garage and put cupboard door back on hinges. Apply cold compress to cheek and check records for date of last tetanus shot. Throw t-shirt away and fetch new one from bedroom. Ring fire brigade to retrieve ferret from tree across the road. Apologize to neighbor who crashed into fence while swerving to avoid ferret. Take last pill from foil wrap. Tie ferret’s front paws to rear paws with garden twine and bind tightly to leg of dining table, find heavy pruning gloves from shed. Push pill into mouth followed by large piece of fillet steak. Hold head vertically and pour 2 pints of water down throat to wash pill down. Get spouse to drive you to the emergency room, sit quietly while doctor stitches fingers and forearm and removes pill remnants from right eye. Call furniture shop on way home to order new table. When loved ones come home, always run to greet them. Never pass up the opportunity to go for a joyride. Run, romp, and play daily. Thrive on attention, and let people touch you. Avoid biting when a simple growl will do. On warm days, stop to lie on your back on the grass. On hot days, drink lots of water and lie under a shady tree. When you’re happy, dance around and wag your entire body. Delight in the simple joy of a long walk. Eat with gusto and enthusiasm. Stop when you have had enough. Never pretend to be something you’re not. If what you want lies buried, dig until you find it. When someone is having a bad day, be silent, sit close, and nuzzle gently. Be always grateful for each new day and for your Master. 1 Veterinarian, 1 Hospital Manager, 1 Receptionist, and 7 Veterinary Technicians. I first heard about this unusual appearing cake from my sister-in-law. She is a human dietician, and believe it or not, the cake was served at one of her professional functions. Since she knows I like unusual and innovative desserts, and we have Foothill Pet Hospital (FPH), she thought voila what a perfect cake for me to experience. According to the internet, over the years no recipe has received as much press. And once you see the finished product, we think you will get just as much of a laugh as I/we have. And, even though cat aficionados will probably like it the most, it is actually a tasty cake too. 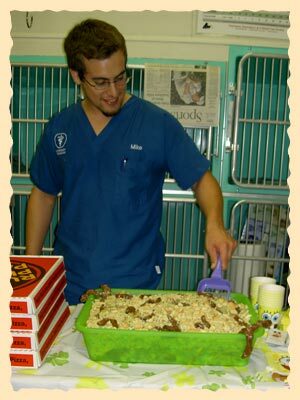 I first served this cake at FPH for Mike Martinez’s going away party upon his acceptance to UC Davis Veterinary School. It was Dr. Rittenberg’s (Dr. Ritt’s) idea, and he knew Mike with his sense of humor would love it too. 6 - 18 oz boxes Duncan Hines Spice Cake mix. 18 - large AA eggs at room temperature. 6 - 1/3rd cups peanut or vegetable oil. 6 - 1 & 1/3rd cups water. 12 - cups whole milk. 6 - 16oz Mother’s vanilla sandwich cookies. 4 - tsp vanilla extract (+/-). 2 - 2.25 oz extra large Tootsie Rolls. 10 - 0.5 oz Tootsie Rolls. 36 - regular size Tootsie Rolls (+/-). 5 - quart mixing bowl(s). 4 - sheet cake pans (18 x 13). 4 cup Pyrex measuring cup. 6 - quart size Ziploc plastic bags. Wash litter box and litter scooper thoroughly!! Spray 2 half sheet cake pans with Pam cooking spray. Let 9 eggs get to room temperature. In a 5 quart mixing bowl empty three packages of spice cake mixes. Add 3 of the 1/3rd cups of oil, and 3 of the 1 & 1/3rd cups water. Break each egg individually into a small glass checking to make sure there are no abnormalities and no shell. (This way if an egg is bad, or if you have some shell pieces, you do not ruin your whole batter.) If the egg is OK, pour this into the Pyrex measuring cup. Repeat until all 9 eggs are in the measuring cup. Then with a whisk or fork, scramble slightly. Pour eggs into the larger mixing bowl. Using a hand mixer on low power, gently blend all ingredients for a minute or so. Then, on medium power, mix and aerate for two minutes. Pour into cake pans. Place in oven for 30 minutes. Then, if you can, switch the cakes on the shelves, and bake for another 30 minutes or until done. So that you have a total of 4 half sheet cakes, repeat for the next 3 boxes of Spice cake mix. In a 5 quart mixing bowl, empty all 6 boxes of vanilla pudding. Then, add all 12 cups of cold milk. Using a hand mixer, mix for about 2 minutes until well blended. Then, place saran wrap directly onto the top of the pudding and up the edges of the bowl so as little air is between as possible. Then, place in fridge to chill for several hours. (Or, if you wish, you can do this the day before.) You may not need all the pudding in the final preparation. Place 1 whole package of the sandwich cookies into one Ziploc bag. (As mentioned prior, for a more realistic color, you may want to try some of the mother’s cookies with some oreo type cookies to get a more true gray color. In other words, for the “right” cat litter coloring, you can use your imagination too.) Repeat with each of the packages. Seal each bag removing most of the air. Then, using a mug or other acceptable heavy object, smash the cookies until they resemble cat litter. Using a microwave safe plate, place 3 of the regular size Tootsie Rolls (with their wrappers removed). On high power, heat the Tootsie Rolls in the microwave for 10 seconds. Without burning yourself, quickly use your fingers to shape the blunt ends of the Tootsie Rolls to make realistic cat poop shapes with curves and what not (i.e. use your imagination). Place these on a wax paper lined large plate. Place in fridge to harden for ½ hour. For the 0.5oz Tootsie Rolls, heat them on a microwave safe plate for 50 seconds to create diarrhea mounds. Let them cool a bit. Then, place them on a wax paper lined plate. Place in fridge to let harden for ½ hour. For the extra large size Tootsie Rolls, heat on high on the edge of a microwave safe bowl. In a 5 quart mixing bowl crumble one of the half sheet spice cakes. Add a few large dollops (about 1  2 cups) of the pudding, plus some of the cookie crumbles, and some of the smaller tootsies. Mushy (mix) this together. Pour all into the litter box. Make it lumpy (textured). Repeat until the box is as full as you wish. Then, sprinkle with more of the cookie crumbs. Artfully arrange your poops both in the box and on the sides. Sprinkle with more of the crumbs. 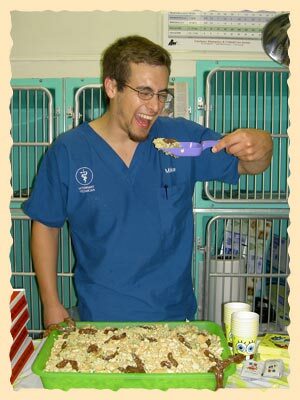 Serve using the litter box scooper! P.S.#1: Don’t forget to have a camera ready to get the impressions of all who see the cake for the first time - and then realize what it actually is too!! 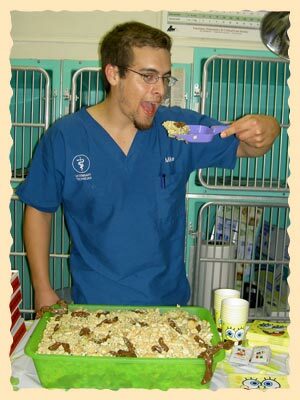 P.S.#2: According to our FPH staff, as an added bonus and for further effect (probably only for veterinary staff and their sense of humor), you can add some cooked spaghetti pieces and orzo to the mixture. They felt these would be good approximations of roundworms and tapeworms! Combine peanut butter, butter and chocolate chips in a microwave safe bowl. Microwave for one minute then stir to blend all ingredients thoroughly. Add 1/2 tsp. vanilla. Stir well. 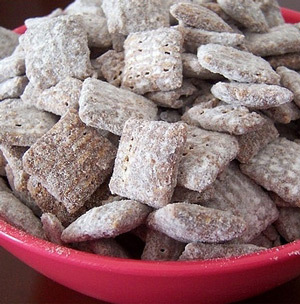 Place the 9 cups of Chex cereal in a very large bowl. 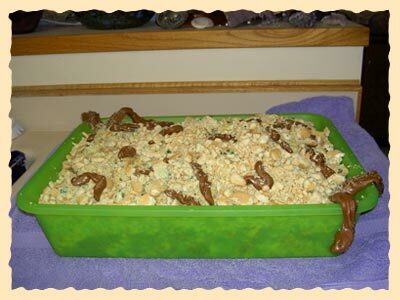 Pour the peanut butter-chocolate mixture over the cereal and toss evenly, making sure all the cereal gets a good covering. Place mixture in large Ziploc bag and coat with powdered sugar, sprinkling evenly over the cereal and tossing as you sprinkle to cover each piece well. Warning: While this story is all meant in jest from an anonymous jokester, some people may not enjoy the mild graphic humor at the end. Read at your own risk. As you know, I have two Labrador Retrievers. The other day I was buying a large bag of Purina at Wal-Mart and was in line to check out. A woman behind me asked if I had a dog. On an impulse, I told her that no, I was starting The Purina Diet again, although I probably shouldn’t because I’d ended up in the hospital last time, but that I’d lost 50 pounds before I awakened in an intensive care ward with tubes coming out of most of my orifices and IV’s in both arms. I told her that it was essentially a perfect diet and that the way it works is to load your pants pockets with Purina nuggets and simply eat one or two every time you feel hungry & that the food is nutritionally complete so I was going to try it again. I have to mention here that practically everyone in the line was by now enthralled with my story, particularly a guy who was behind her. Horrified, she asked if I’d ended up in the hospital in that condition because I had been poisoned. I told her no, it was because I’d been sitting in the street licking my balls and a car hit me. I thought one guy was going to have a heart attack he was laughing so hard as he staggered out the door. © 2007- Foothill Pet Hospital. Site Design: DaLee & Company, Inc.